Quiet hours are form 10:00pm to 7:00am. The entrance gate is closed from 8:00 p.m. to 7:30 a.m. Check-in is 2:00 p.m., check-out is noon. The Oak Hollow Campground is open year-round and offers campers the opportunity to relax in the beauty and serenity of the great outdoors. Located within the 1,550 acre Oak Hollow Park, many of the campsites border the scenic shores of Oak Hollow Lake. 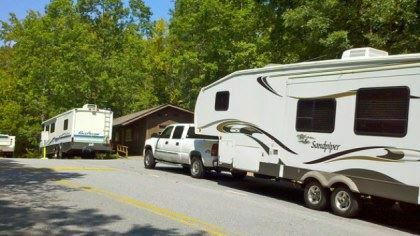 We offer 107 RV sites- full hook up and 13 tent platforms. Several sites available on a first-come, first-served basis. Campers must register in the office by 7:30 p.m. Late check-in is not permitted. For help with registering online, watch this video tutorial for step by step instructions. The pool is available to registered campers only. The pool is open annually from Memorial Day weekend to Labor Day weekend.